C#, .Net Framework: Internet Explorer 7 Favorites Problem . What I thought was a smart Idea. 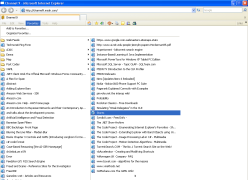 I have a bit of an issue with IE7's favorites. If you have too many favorites to fit on one screen IE7 splits the favorites into multiple columns of favorites. I think this is a bit of a bad design. 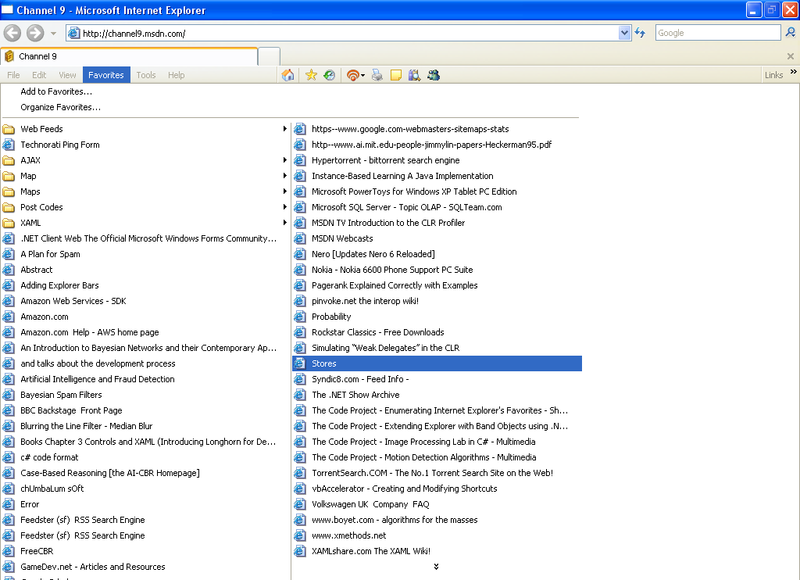 I kind of like the old IE6 method; scrolling menus. Just take a look at this image to see what I mean. I agree with your observations. There is another obvious bug with IE7 when you try to delete a favorite from the list. When you right-click on the favorite, then click 'delete', it gives you a dialog box asking whether you want to delete. Click on 'OK' and it does nothing, just sits there and hangs. I also don't like the way they got rid of the slider, which allows you to go the the bottom of your Favorites list quickly. Now you've got to sit there and wait forever while IE7 slowly, slowly, slowly scrolls to the bottom of the list. Aagh! I hadn’t even discovered the splitting and no-scrolling annoyances until I read this (although I seem to be able to right-clickdelete OK). What has really been bugging me is that I can’t reposition my bookmarks directly in the main Favorites panel – have to go and do it in the Organise Favorites interface – extra clicks AND small window size, no scrolling.